Fixing all the roads and bridges in Pennsylvania is not an easy — or cheap — job. 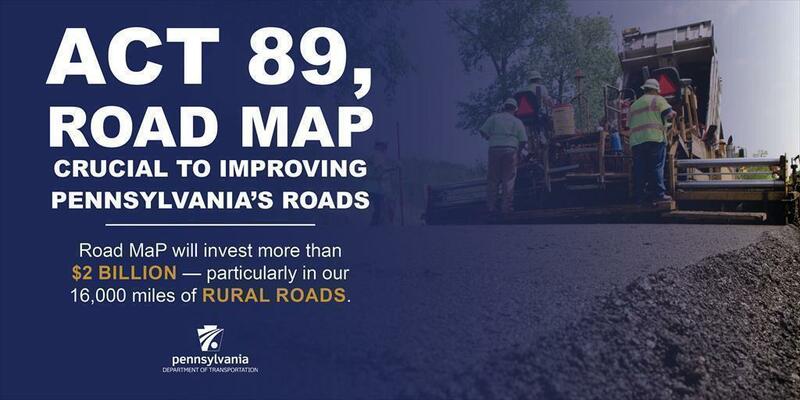 Act 89 of 2013 has made great strides on allowing PennDOT to undertake and complete outstanding projects, but more is needed. That's where our Road Maintenance and Preservation (Road MaP) program comes in. Announced earlier this year, Road MaP will invest more than $2 billion in roadway maintenance and highway and bridge capital projects over the next 10 years. Of that, $1 billion will go to our county maintenance to support basic system preservation needs through department and contract work. Our 67 county budget allocations haven't changed since 2005-06. The investments (PDF) are being made possible due to legislative action in 2016 that caps the expenditures from the Motor License Fund going toward the State Police budget beginning with the 2018-19 budget and concluding with the 2027-28 budget. And, if Governor Wolf's proposed $25 per capita fee to offset the cost of the Pennsylvania State Police's coverage for municipal-level services is approved in the 2017-18 budget, PennDOT will see an additional $63 million in that year. OK, so PennDOT will get more money, but how is that going to help you on my commute? Simply, it's going to help a lot. Funding from Act 89 already has allowed us to complete nearly 2,000 projects, with another 848 underway. And the funding through Road MaP will specifically allow us to address many of our nearly 16,000 miles of roads located in rural areas with a population less than 5,000. One way we are improving these lower-volume roads is by using recycled asphalt pavement (RAP) in more of our counties. RAP repurposes materials from projects onto other roadways by mixing ground millings with oil. It's an environmentally conscious method that saves the need to purchase new material and stretches our dollars so we can impact more miles of secondary roads. PennDOT road crews apply recycled asphalt pavement in Armstrong County. RAP has been used for quite some time in our northwest region, and it's estimated to have saved the region roughly $5.4 million annually. We also recently launched RAP usage in Armstrong County, and will use it again in Monroe County this year, with more to come in 2018. Armstrong County used RAP on 1.9 miles of Route 2018 and 3 miles of Route 2012 — chosen based on their "poor" pavement-quality rating and proximity to the stockpile where the materials are stored. With roughly 3 inches of RAP compared to an equivalent of 2 inches of new asphalt, we estimated a cost of $225,000 compared to about $371,000. That money will be redirected to other maintenance improvements or contracts. For more information on projects occurring or being bid this year, those made possible by or accelerated by Act 89, or those on the department's Four and Twelve Year Plans, visit www.projects.penndot.gov.